The weekend of March 10th the San Francisco Korean School and the Education for Social Justice Foundation organized 4 talks about Dosan's legacy in San Francisco and a tour of historical sights where Dosan and other patriots worked for the Independence Movement around the City. San Francisco by far is the most important location for the Indpendence Movement. 샌프란시스코 곳곳에 서려 있는 ‘도산 안창호 선생의 발자취’를 투어하는 행사가 11일 열렸다. 1902년 샌프란시스코에 도착한 도산 선생은 1912년 대한인국민회, 1913년 국민회, 흥사단을 창립하는 등 활발한 항일독립운동을 해온 민족의 위대한 스승이다. 이날 장인환, 전명운 의사가 친일파 더햄 화이트 스티븐스를 저격한 페리 빌딩을 시작으로 도산 선생과 부인 이혜련 여사가 처음 샌프란시스코에 와서 월 렌트비로 8.50달러를 내며 살던 차이나타운의 아파트, 독립운동의 중심이 되었던 상항한국인연합감리 옛교회당 등을 둘러보며 도산의 숨결을 느꼈다. Follow Inthekimchijar with Han and Flip and a variety of guests mixing all kinds of topics into some tasty and sometimes very spicy exchange of opinions, ideas and sometimes educational information. Warning for Parents and Meek listeners there are Fbombs dropping among other strong language! We get quite passionate in our discussions because we deeply care about Korean issues and history. We speak our minds... We don't get paid... We can't get fired! So many people have watched the cartoons Richard worked on as an animator. His IMDB is impressive. Richard donated most of his archives to the USC Korean Heritage Library. A tribute to our close family friend who was a sincere and kindhearted man. Richard Khim passed away yesterday in Walnut Creek. Richard moved up North to be near his grandchildren a few years ago. At the community residence where he lived in Danville he and his wife were the only Koreans. Richard as always put his best foot forward and taught art classes to his non-Korean neighbors. Everyone loved Richard and his wife. Richard was a great representative of the good things about being Korean. Richard Khim (Young Woo) worked as a Korean Radio and Television Anchorman in the Korean American Community. 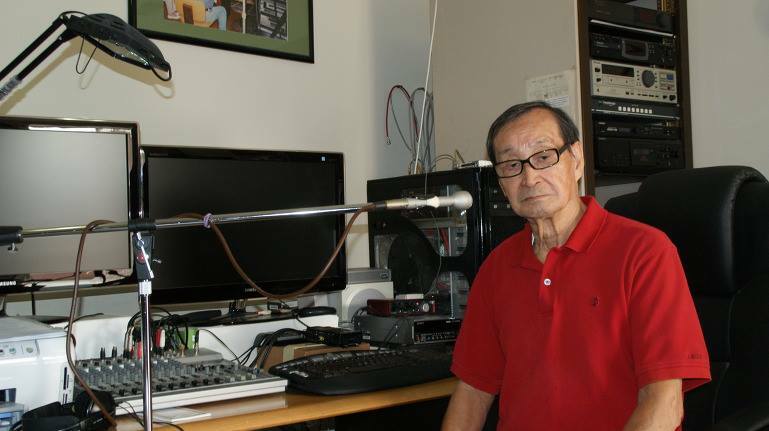 His first radio announcer broadcast was in 1961 for MBC Radio Seoul in Korea. Richard came to Los Angeles in 1963. 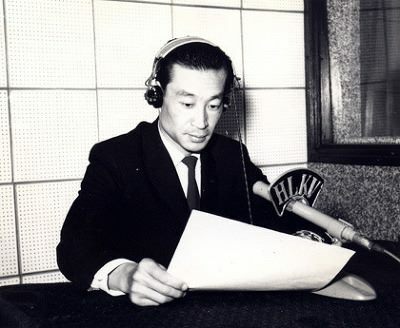 On June 12, 1965, he hosted the very first Korean Language Radio program in America, a 30 minute show on KTYM-FM. In 1974, Richard created “Radio Korea” at KTYM-AM sponsored by Korea Times L.A. and the Command Television Program TV-Han Kook. In 1991 Richard set up KTAN-TV studio productions at KRCA UHF Channel 62. And, on January 11, 1993 started their MBC syndicated Korean programming. In 1992, Richard opened Hi-Media Productions to develop programs like the 13 episodes of Reminiscence of Korean Americans presenting stories of Koreans who served the community and were successful in mainstream American society. Richard has captured many valuable stories of Korean and Korean American heritage on tape and film. Richard documented many Pioneer Koreans in the community. In 2004 Richard and I produced and published the "Susan Ahn Cuddy My Heritage" DVD for Dosan's eldest daughter and my mother. Enjoyed being with the UC Berkeley students on Friday at Dwinelle Hall. I greatly appreciate the invitation and time spent well. We discussed and shared a lot of history about the Independence Movement activism in San Francisco and Dosan. I think they became aware of a history they had not been taught. 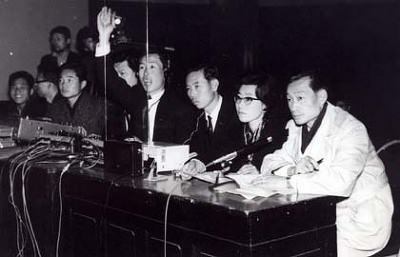 The UC Berkeley Committee for Korea Studies (CKS) was established in 1986. CKS has actively researched various political, social, historical, and cultural issues of Korea. CKS has also engaged in many activities around campus to raise awareness of Korea. According to Dosan's teachings, the development and support of a true leader was undoubtedly one of the most significant factors in an organization. A leader had to possess a sincere and respectable character to be a good influence on others; and, he had to display ideals he believed in by way of his own actions. In order to save Korea from Japan, Dosan believed this type of leader was the one who could lead the nation one step closer to its independence. Starting from the Shinmin-hoe - New People’s Association era (1906-1911), Dosan had the consistent commitment to developing capable individuals for leadership. Developing the Korean nation's future leaders can be interpreted as one of his key hopes and strategic approaches to gain independence. The role of sound leadership was the most essential component in unifying the Independence Movement forces to fight the Japanese. For the past twenty years one day each Summer the KW Lee Youth Leadership Training program presented a session on heritage. Most Summers the program placed about twenty high school and college students in the program. You had to respect these young folks because they gave up most of their vacation to be in leadership training. There was no doubt that these students were sincere about learning and cared about their heritage. The first session was about the Pioneer Generation of the Independence Movement era - the first Korean Americans. These are the Korean families outside of Korea who fought the Japanese to keep Korea from being wiped off the face of the earth. Without these peoples' sacrifices Kpop, Korean dramas and Ktown and everything else K would not exist. Everything could have been J. However, very rarely was there a student who knew how to embrace their heritage. Dr. Ikhwan Choe of the University of Washington explained: "... the love of one's heritage... is not the same thing as a blind acceptance of it." The majority of students as well as the staff and the program organizers we're in the blind corner. The session about their heritage gave them a reason to have a little "love". Throughout the Korean American community this vague sense of heritage is a typical situation. Dr. Choe's essays on heritage spell out the importance to grasp it. "Our heritage is the form in which our past is bequeathed to us. When we talk about the use of heritage, we are really talking about the use of the past." So we are talking history - Korean American history in this case. Choe makes it pretty clear: "One dishonors Korean heritage if one allows it to degenerate into a quaint badge of one's marginal existence in the larger society." Korean American heritage is full of people who left meaningful and inspiring legacies. Within that Pioneer Generation there are some amazing stories worth knowing well. So... How well do you know Dosan? Historically for thirty plus years, he was the central figure of Korean and Korean American history until he died in 1938. Freeway? Post Office? Satue? And... What do you think about revisionism that manipulates the historical truth? Does it impact your heritage if it changes the truth? What or who leads you to believe what you believe about KHsitory? Dr. Choe wrote: "As an individual and as a species, we construct the world we inhabit by endlessly telling stories to one another." These days too many stories have too little truth. Abe Lincoln said: "History is not history unless it's the truth." Protect your heritage, your history - learn the truth. Historical perspectives of scholars in Korea are in need of a better understanding of what happened in America during the Independence Movement. Most of the Korean American scholars have a limited understanding of Dosan and what happened in Asia during the Colonial Period. Therefore, this era of history is not taught very well in Korea and here. There are many reasons that contribute to the problems of learning accurate history. The Korean and US governments have censored many sources of information - as much as Japan has done to hide the truth. Right now, South Korea is in the hands of the families of chinilpa (Japanese collaborators) who were protected by US government. Censorship is a big problem affecting learning the truth. Here is an example. US Congress passed a resolution to have Korean American Day set on January 13 based on Korean immigration to Hawaii in 1903 and the bogus Centennial of 2003. American businessmen and Korean puppets of American missionaries in Korea broke the immigration laws in 1902 to bring the large wave of Korean " contract laborers" to Hawaii to break the Japanese workers' strike. Dr. Wayne Patterson (Korean Frontier in America - Immigration to Hawaii 1896-1910) clearly shows the illegal nature and the conscious manipulation of politicians and laws allowing this deceptive venture to develop and take place. So, in 2005 US Congress passes a misconceived resolution in a sense memorializing breaking of immigration laws because accurate details of Korean and Korean American history were not the foundation of this resolution. They did it for money and votes not out of any respect of history. A lot of lies made this happen. A group of opportunistic individuals in the KA community from Hawaii to Washington DC pulled the wool over the eyes of numerous politicians from President Bush to power hungry LA City Council members. Korean American political office employees like Alexander Kim and Janny Kim were both informed about the illegal immigration issue. Since they were more interested in ego driven self advancement they ignored the truth that I personally explained to them at a dinner here at Susan's home. Recently, ignorant deceptive Korean American businessmen pulled the wool over New York politicians in 2014. The Korean Economic Institute of America based in NY should have more integrity and a better knowledge of history instead of using this day to inflate the egos of its members. As you know, I am very opinionated and vocal about what I think about Korean and Korean American history, as well as deceptive opportunists. Most people do not know the extent of my experiences studying the wide variety of information forming my opinions. I'm preparing to launch a Dosan and Korean American history study program in the near future. "History isn't history - unless it's the truth." Abe Lincoln. Dosan admired Lincoln.